Sydney Shop Girl: Grating Ginger. My Boutique. It was a rather productive day off yesterday. Toddler SSG's perfect start to the morning - a babycino, a sheet of numbers to read and a tall glass of freshly squeezed OJ. In no particular order. And not only because Toddler SSG and I managed to get out in the morning sun for a walk and a break for drinks before the rain set in. Yesterday was noteworthy for something more mundane. I cleaned the Microplane grater I thought I'd ruined by grating fresh ginger wedges on it. Everytime I use it, the sleek stainless steel cutting surface stares back at me from behind a moustache of ginger fibres that no amount of scrubbing, rinsing or soaking seems to have been able to remove. So yesterday afternoon, I sat myself down with the grater, a paper towel, a skewer and my fingers and plucked my Microplane back into almost new condition. And then I Googled to fiind out how I could prevent it from happening again. Turns out that it's easier to Microplane frozen pieces of ginger. You're also meant to grate along the direction that the ginger fibres have grown, rather than across them. And of course, there are also special ginger graters you can buy. Traditional Asian ones are made of porcelain and come with bamboo cleaning brushes and there are also high tech graters with boxes to catch gratings and tools to help peel your ginger. Having just done a massive cull of kitchen gadgets I've bought and hardly used, I'm holding off buying a dedicated ginger grater until I've tried the frozen grating trick. 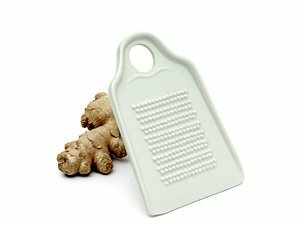 Have you got a dedicated grater for ginger? Which one and does it work well for you? One of the things I enjoy most about the diverse group of people I follow on Instagram is their willingness to share new finds and ideas with the rest of us. The accounts I find I learn the most from aren't always the professional 'influencers' who seem to be getting a lot of attention in the press at the moment. It's more likely to be from the personal and more relatable 'this is my everyday life warts and all' accounts that I get my inspiration from. The_Stylish_Teacher on Instagram recently posted a photo of herself wearing a dress from My Boutique, a Geelong based online (plus a few selected stockists) fashion label created by Dani. The unique feature of Dani's label is the unique and house designed prints she uses in her clothing. The fabrics for the spring summer range are easy to care for and light weight rayons which are perfect for my working mum wardrobe. What's more, every item of clothing is less than $100. In addition to all of this, what I like most about My Boutique dresses are that many of them are perfect for work. Like The_Stylish_Teacher, I spend my working day on my feet and while I do like to look 'dressed' for the day, I also need sensible neck lines, skirt lengths and enough room in a dress to not feel like I'm strangling myself every time I bend or kneel. I managed to find all my needs in the two dresses I ordered earlier this week from My Boutique. I know, I ordered Tuesday and my beautifully wrapped order arrived from Dani on Thursday. Complete with a lovely thank you note and gift from Dani herself. Here's what I ordered. Most pieces come in a variety of fabrics.. which might make it hard for you to decide which to get. First up is the Helena midi dress in Amazonia ($84.99). This is a close up of the Amazonia print as seen on my dress. It falls past the knee on me and the blouse like over layer gives this shift dress a flattering and less body conscious look while still being formal enough for work. What can I say. I love vivid prints in summer and I'm really looking forward to accessorizing the simple lines of this dress. Now all I have to do is to wait for this crazy Sydney weather to make up its mind and stop being so wet and stormy. I've got frocks to wear but not the weather to wear them in! Do you get fashion and style inspiration from Instagram? From the professionals, the everyday people or a bit of both? you are keen re the ginger. My thermie will make short work of it. Or ginger in a jar is good too. I like to people watch to get fashion advice, or follow fashion blogs, or instagram too. Porcelain ginger grater, all the way. Easy to clean, no skewers required!